We’re dreaming of the great rides that will happen as soon as spring comes along. So, where will you ride to and what to do in 2019? Allow us to give you some suggestions. Freddie Paul recommends riding to the Italian GP at Mugello to enjoy a track invasion amongst the Rossi faithful. Based on his trip to the 2018 event this seems like a good idea. Ralph Edelstein proposes a cross-Europe rally, from Romania to Gibraltar, which could be what your adventure bike was made for. Gary Johnson reminds me why I need to get to the TT again and Adam Smallman makes the case for a few more trackdays. Go on, you know you want to. Most worryingly, Gary Inman suggests middle aged bones and bad backs are no excuse not to take up racing, and if he can do it why can’t we? See if you can resist the lure, or join Gary on the grid in 2019. Before all that excitement we’ll start the motorcycling year with a trip to the London Motorcycle Show on 15-17 February. But it’ll still be winter then. Enjoy the issue, and keep sending pictures of your Bike patches and stickers. 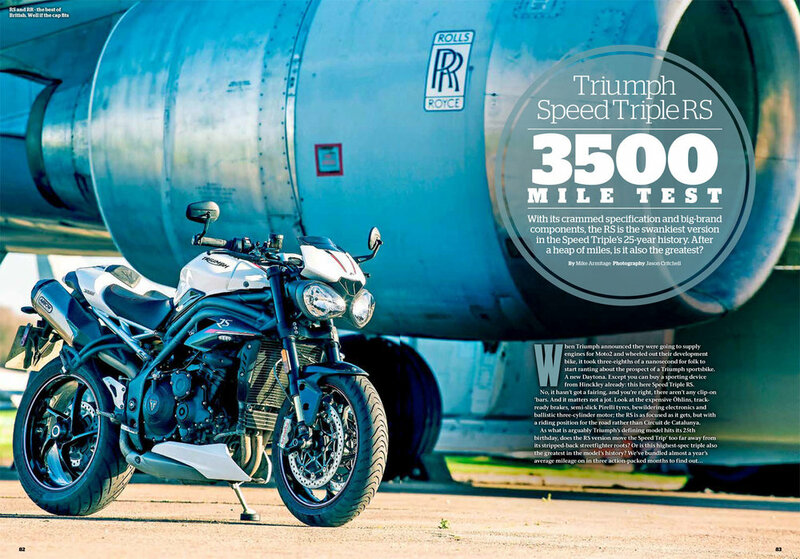 Triumph Speed Triple RS - with its crammed specification and big-brand components, after a heap of miles, is it also the greatest?